Walter de' Silva, head of VW Group Design, is quoted in Audi press materials as saying that the A5 is the most beautiful car he's ever designed. Even discounting his understandable enthusiasm, it is a gorgeous car, particularly when viewed from the rear quarters. While the A5 coupe makes do with a 3.2-liter V-6 and 265 hp, the S5 is tailored for enthusiast drivers and receives a comprehensive make-over by the boffins at Quattro GmbH. Bigger brakes, more engine and an up-rated suspension top the list of enhancements. The interior features the typical Audi attention to textures and colors and it's both attractive and functional. On my test car it was also a bit somber, with the seats, headliner, dash, carpeting and door panels all swathed in black. Only a few bits of bright trim helped brighten the ambience. The quality of some of the plastic trim is a bit marginal and there is other evidence of cost-saving. The standard steering wheel, for example, adjusts for rake and reach but manually, not electrically. A big color screen dominates the upper center stack and doubles as a highly effective backup camera. It's coupled to the MMI operating system which, unlike BMW's infuriating I-Drive, can be mastered in a few days. At the front of the center console is a switch for the electro-mechanical e-brake that saves some real estate. The driving position and sightlines are both good although the driver's seat lacks enough lower-cushion padding to be comfortable on trips of more than a few hours' duration. Rear-seat legroom, while not overly generous, is sufficient to accommodate six-footers in reasonable comfort for journeys of the same length. Headroom in back is unusually good for a coupe, due to careful sculpting of the headliner and a sunroof that tilts up but doesn't slide back, to avoid robbing headroom. Trunk space is a substantial 16.1 cubic feet, all of it usable thanks to a flat load floor with a moderate lift-over height. As a high-performance transport, the S5 has more than enough interior room for a vacationing couple taking every piece of their gear on a cross-country journey. The heart of the S5 is an all-alloy 4.2-liter DOHC V-8 with 354 hp at 6800 rpm and 325 lb-ft at 3500. A six-speed manual is the only transmission choice although a six-speed Tiptronic autobox joins the lineup later this year. Quattro all-wheel-drive is standard and does its usual seamless apportioning of power between front and rear axles and from side to side. The engine is a gem with a wide powerband, good midrange grunt and adequate top-end power. The six-speed is generally cooperative and you'll never miss a gear in ordinary driving. But like some other Audi manuals, it somehow manages to turn both rubbery and notchy when you're seriously in a hurry, snapping off shifts. Steering feel is good if unexceptional, although there's a bit of on-center numbness that sometimes hampers path accuracy on cratered roadways. Still, self-centering action is excellent and under most conditions it tracks beautifully at speed. The four-corner multilink suspension is taut but supple, with very good isolation from impacts. Roll resistance isn't particularly high in comparison to some competing models, but body roll is less perceptible from inside the car than from the outside. Braking power is substantial, courtesy of 13.6-inch vented front discs and 13.0-inch rears. They bite ferociously at the first hint of pedal pressure, requiring some attention from drivers concerned with smooth operation. Overall braking performance is impeccable. Handling is benign, with less of the determined understeer typical of past V-8 Audis. Much of this is derived by relocating the front differential to in front of the clutch, resulting in a more favorable front/rear distribution of weight. Short front and rear overhangs also contribute to this heightened appetite for prompt turn-in and less initial push in the corners. Cornering grip is high, thanks to aggressive 255/35 summer performance tires fitted to handsome 8.5-inch by 19-inch five-double-spoke alloys. Standard inflation pressure is a lofty 39 psi, leading to occasional impact harshness in reaction to potholes. The quality of the overall driving experience is dampened noticeably by a drive-by-wire throttle that refuses to behave. Power delivery is uncommonly non-linear, making forward progress in the lower gears a graceless series of bogs and lurches, setting passengers' heads to bobbing like apples in a barrel, leading some to inquire if the driver is new to the intricacies of a manual transmission. The effect is aggravated by the S5's generous brake dive and acceleration squat, and the engine's propensity for hanging onto revs, requiring of even an expert driver the utmost attention to achieve smooth take-offs and gear changes. There's no way to tell if mine was the only S5 so afflicted but I'm inclined to doubt it. The throttle of the S8 I tested last year performed identically. But that car's automatic transmission helped to mask the effect. No such luck with a manual. Drivers who prefer shifting for themselves and who take pride in imperceptible gear changes would do well to spend time in a six-speed S5 before signing the check. Audi quotes a 4.9-second 0-60 time, which would be exceptional for a 3,891-pound car with an 11:1 weight/power ratio. But mindful of an engine-rpm limiter in first gear that prevents side-stepping the clutch, I saw 60 mph in 5.5 seconds and cleared the quarter-mile in 14.2 seconds at 99.6 mph. Top speed is limited to 155 mph. 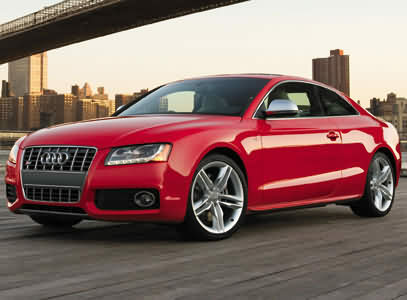 Base price for the 2008 Audi S5 Quattro MT is $50,500. The test car, with three major options, was $57,515, including a $1,300 gas guzzler tax. Not small change perhaps, but hardly excessive for this fast and very stylish coupe.